You have one week in Barcelona city for a vacation and you want to make the best of it. 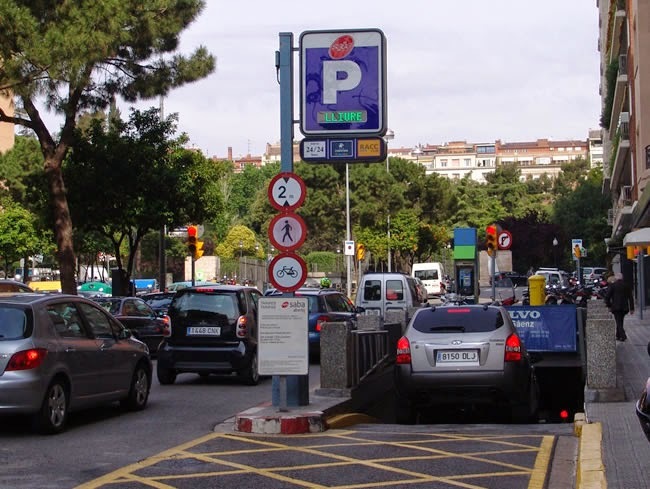 So you decide that hiring a car in Barcelona city will save time. At some point you may be right but you should remember that rent a car in Barcelona city may give some problems to you. So in this article we will try to mention about advantages and disadvantages of rental car in Barcelona city. First of all you can start to plan your trip including the person number attending to the trip. After that, it will be a good idea to decide whether you really need a car rental in Barcelona city for your travel. As the transportation in Barcelona is really easy you can get everywhere whenever you want and in time as you wish. The transportation network is quite wide and even the farthest places can be reached easily by public buses or metro. Apart from these, parking can be a problem in Barcelona city. There are green or blue zone at the streets for public parking for your private cars which charges you at least 3€ for an hour and you can't buy a ticket for whole day. So that means, you need to buy a ticket for every two hours. If you calculate the payment at the end of your holiday this means a lot. Of course there are big underground parking garages operated by SABA located every district in Barcelona city and definitely they will be close to your hotel/apartment. You can park your car there for many days you want and if you pay for weekly or multi days it will be cheaper. As metro stations and stops are connected to each other, travelling the city is really easy on your holiday by public transportation but if you really need a car rental then we can recommend you some rental car companies. If you would like to rent a car at the airport then you have lots of choices. At terminal there are two car rental companies but once you come out of the terminal and walk just a few minutes and across the road you will see many car rental firms opposite you. It's possible to rent a car in Barcelona city online before you arrive the city. So how much does it cost to rent a car in Barcelona city? To rent an average car in Barcelona city apart from parking lot fee but with gas inside for a week is approximately between 200 and 250€. It includes all gas and insurance stuff. The parking fee is around 60€ for a week. So you should add this to the cost. Actually it doesn't cost too much if you travel crowded. It may be cheaper than public transportation and you can discover the places that public transportation doesn't stop by. If you visit Barcelona city on summer and decide to swim and see the beaches then having a private car would be helpful very much. When you plan a Barcelona city travel you can look through what you need at our site. So it can be helpful for you to follow your Barcelona city travel guide. When we make recommendations for our site visitors, we try to make the best ones. We care about your time, money and effort. So for your best holiday in Barcelona city we will keep on giving the cheapest, best and easiest ways for your travel. Here below there is a map showing car rental companies at city centre in Barcelona city so that you can check the nearest one to your hotel/apartment. Apart from idea of renting a car in Barcelona city you can also think about the options of travelling by taxis. Taxis in Barcelona city are yellow and black. It's easy to recognize. You can call a taxi by just raising your hand in the middle of the street or wait for a taxi in front of the big hotels or at the city centre. At nights taxis are a little more expensive. Be sure that you talk about luggage, passenger number and trips to airport with the driver beforehand. These points may change the current fee for taxi. Sometimes at the weekends it may be a little harder to find a free taxi in a short time but don't worry about that as Barcelona city is a really big city and offer a newcomer many public transportation ways. There are plenty of taxis so it won't be so hard to find. Generally taxi drivers don't know English. They just speak Catalan or Spanish but somehow they are eager to do their best to comfort you and they will take you wherever you want to go. If you haven't decided on transportation options in Barcelona city you can read more about public transportation in Barcelona city by clicking here. Hi admin,This post is really great.